Natural flea prevention is a much safer choice than making your dog wear, or ingest, chemical flea treatments. Many veterinary prescribed or OTC dog flea products can cause nasty, even deadly, side effects and they're not just dangerous for our pets. Anyone who comes in contact with these products (before or after application) can be at risk too. The natural flea control methods and tips featured on this page can help keep your little Fido flea-free without putting his health (or yours) in jeopardy. When it comes to fleas, prevention is always better than the cure, so it pays to be pro-active. Fleas are parasites. 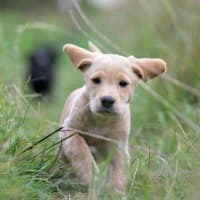 Tough, hardy, prolific breeders who see your precious puppy as a hot meal and a warm bed... for life. Parasites aim to live off their host, and to make that as easy as possible for themselves. One way that they do this is by targeting young, sick, weak or immuno-compromised animals first. So one of the first natural flea prevention recommendations is to keep your pup healthy, and support his immune system so that he isn't an appetizing treat for fleas. Diet is hugely important in terms of keeping little Rascal healthy and strong. 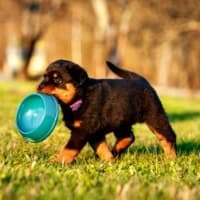 You can check out my Natural Puppy Food page to learn more about what he needs, and how to give it to him. In addition to feeding him properly, your puppy has a bunch of other, very specific health care requirements which need to be met if he's to stay in tip-top condition. Take a look at my Puppy Health page to get a comprehensive look at how to keep Rascal healthy and strong. 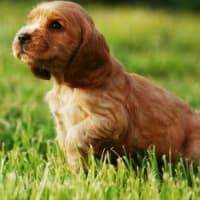 Supporting his immune system is also hugely important because puppies experience a lot of stress during the first few months due to their rapid growth/development and the number of environment changes they experience. There are several different immune boosting supplements you can add to your puppy's meals, or give once or twice a day instead of treats. Omega-3 and Omega-6 fatty acids improve overall health and support a strong immune system. And hygiene.. what do I mean when I say good hygiene is important? Yes, keeping your little Rascals skin and coat clean is important for lots of reason, but when we're talking about flea prevention, good hygiene extends to his living environment - both indoors and out. Fleas multiply with almost unbelievable speed! Female fleas like warm, dark, damp places to lay their eggs, and one flea can lay several hundred (possibly even thousands) of eggs during her lifespan. Between two days and two weeks later the eggs hatch into larvae which cocoon themselves the way caterpillars do before turning into butterflies, before emerging as fully developed fleas when conditions are right (which can take anything from one week to six months). The warmer and more humid the temperature the more quickly the larvae hatch, which is why fleas are much more prevalent during Spring and Summer. Once your pup becomes a flea-host he will deposit his little free-loaders throughout his home and yard. Washing laundry, drapes, sheets, dog beds, cushion covers and throw rugs regularly (on hot) can help kill eggs and larvae. As can daily vacuuming. Outside, using natural flea control products and keeping grass SHORT and bushes trimmed removes many of a fleas favorite hiding spots. Mainstream/chemical flea preventatives are either applied topically, or fed to your puppy as a chewable or tablet. The same goes for natural flea preventatives which literally make your pup less tasty, and therefore less attractive, to fleas (without the dangerous side effects). Some suggestions for natural flea prevention work from the inside out, like adding Garlic and Brewers Yeast to his diet. It seems that ingesting these changes the flavor of little Rascal's blood and not in a good way as far as the fleas are concerned. Giving raw garlic to dogs is a no-no because it can cause digestive upset, even be toxic in large doses. Another inside-out way to discourage fleas from feasting, and setting up home, on your pup is to give him Organic Apple Cider Vinegar (get the kind which says 'with The Mother', eg. Bragg Apple Cider Vinegar) which is the one I use for all sorts of health remedies for the two-legged and four-legged family members. Adding it to your pup's water bowl is probably the easiest way to get him to take it. You can start out with one teaspoon for every four cups of water to help him adjust to the taste, then build up to one tablespoon per four cups. If you add a little ACV every time you refill the water bowl that should work pretty well. Some dogs hate the taste of ACV (I'm not a huge fan myself, but it's good for me so I take it. Rascal doesn't have the same understanding), some don't even seem to notice it's there. If your pup is one of the former, try adding the ACV to a little low-sodium chicken broth. Chances are good that your little guy will guzzle it all down no problem. Natural flea prevention can be tackled externally and because the items/products you use are natural and chemical/pesticide free, they're safe as well as effective. Don't just take labels stating a product is 'natural' at face value. Always check the ingredients list for artificial additives. If you don't recognize the name of an ingredient, or it sounds artificial, look it up so that you know what you're putting on your pup. Diamotaceous Earth is a fine powder made up of fossilized phytoplankton and is rich in mineral silica. It's a totally safe, all natural and chemical-free pesticide which works on all kinds of creepy crawlies, especially fleas, ants, cockroaches and bedbugs. 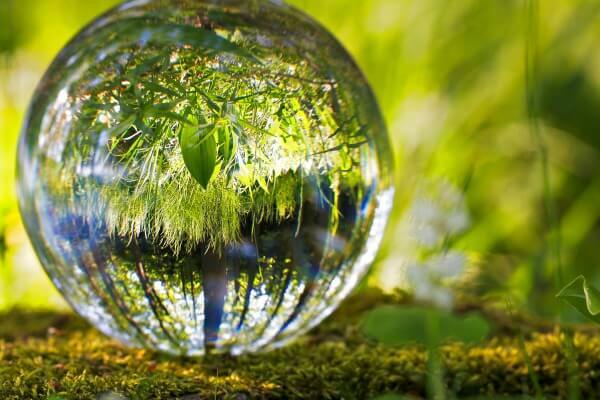 Although it looks like a find powder to the naked eye, each miniscule grain of DE is very sharp, almost like glass and this physical property allows it to damage, and penetrate, the hard outer bodies of insects. They then die of dehydration, no chemicals or dangerous insecticides required! Food grade Diamotaceous Earth can be safely ingested by pets, livestock and other animals as well as by humans. It's a natural anti-parasitic and can be used to kill internal parasites such as worms. The ONLY type of DE you can use for natural flea prevention is FOOD GRADE Diamotaceous Earth (preferably fresh water sourced). AVOID chemical-grade DE which is used to treat swimming pools and some manufacturing processes. It is not suitable for use on people or pets. Diamotaceous Earth provides versatile natural flea prevention! It can be applied to your pup's skin/coat, added to his food, a light dusting given to his bedding, carpets, flooring, soft furnishing, grass, earth, flower beds and more. It's totally safe to ingest and although chemical-grade DE is dangerous when inhaled, food-grade DE is not. Obviously that doesn't mean you should breathe it in any more than is necessary (and neither should Rascal) and if you're asthmatic, have inhalant allergies or lung/sinus problems it's best to wear a mask when applying DE. When dusting indoors with Diamotaceous Earch it's best to leave it down for several days, or a week, to give it time to work. Then vacuum it up and reapply if necessary. Using DE outdoors is just as simple, but it's important to know that if it gets damp then it stops working. So, in dry weather you simply re-dust areas every few days or once a week until the fleas are gone. In damp or wet weather you'll need to re-treat areas more frequently and overall the efficacy will be less. You can apply food-grade Diamotaceous Earth directly to little Rascals coat and rub it in well, making sure it goes all the way down to his skin. It's safe to use all over, pay special attention to around his neck, behind his ears, on his belly, his 'armpits', inside upper thighs and base of spine/tail which are all areas where fleas like to congregate. If you want to be a little more creative you can add organic Neem Leaf Powder (we'll look at Neem in more detail further on in this article) to the DE to make your own totally natural flea powder. A ratio of 2:1 (DE:Neem) is good. Although you can add a few drops of certain essential oils (eg. Eucalyptus, Peppermint, Cedar, Lavender, Sweet Orange) diluted 1:4 essential oil:carrier oil to the DE powder, or DE/Neem powder mix if you're using it on adult DOGS, don't use oils on puppies, it can be dangerous... and never use essential oils on cats! Apple Cider Vinegar can be used externally as well as internally to discourage fleas from biting your pup. Whichever way you choose to use it, make sure you don't pour/spray the ACV/water solution into his eyes, ears or nose as it could cause irritation. You can also use the 1:1 solution to spritz carpets, bedding and furniture to repel fleas. 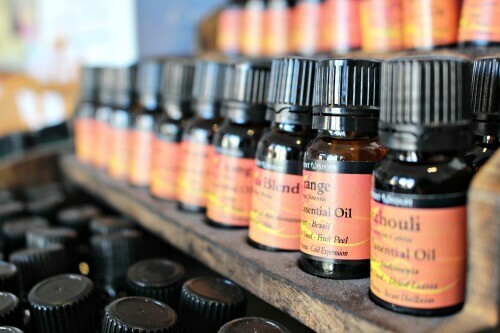 If you want to add a few drops of insect-repellent essential oils (eg. Eucalyptus, Peppermint, Cedar) to the spray it can help increase it's effectiveness. But only apply a solution which contains essential oils to an adult dog, or to furnishings and carpets. It's not safe for puppies and should never be used on cats (or in areas cats may sleep or spend time). Neem Oil is made from the seeds and fruit of the evergreen Neem tree found in India and other tropical areas. Neem has been used as a natural remedy for centuries and for dogs it is an effective flea and tick repellent, promotes healthy coat and skin and boosts the immune system. Because pure Neem oil can cause skin/eye irritation you need to dilute it in a 1:10 ratio with a carrier oil (Almond oil is a good choice), and add a few drops of the mixture to the palms of your hands and then rub them over your pup's coat. For a natural flea-repellent spray, add 1/2 oz of Blue Dawn dishsoap to 2 cups of warm (not hot or cold) and then add 1/2 oz of Neem oil. Allow oil to dissolve and shake GENTLY to mix. Use this spray right away. The active properties of the Neem oil will stop working after about eight hours so you need to make this solution as and when needed. You can turn a simple, mild puppy shampoo into a natural flea shampoo by adding 1/2 oz of Neem oil to every 8 oz of shampoo (equates to 5ml Neem oil per 100ml shampoo). Neem Leaf Tea is less potent than using Neem oil, and a little more complicated to make, but it's an excellent natural flea preventative and is safe for young puppies and cats. To make Neem Leaf Tea you want to steep about 1lb of organic dried Neem leaves in 12 cups of water for 12 hours or overnight. Next morning, chop leaves up well (leaving them in the water) then filter the mixture twice, once through cheesecloth or fine muslin, and the second time using a coffee filter or filter paper. 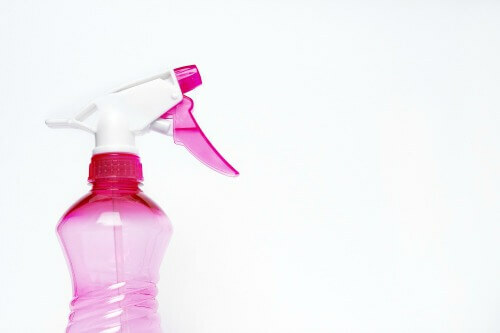 Pour the resulting liquid into a spray bottle and apply to your puppy once or twice a week. Can also be used as a rinse after shampooing. Neem oil can be irritating or cause tummy upset if ingested so as far as possible discourage your pup from licking his fur or trying to 'eat' the spray. Looking for a ready-made natural flea prevention option which contains neem oil? Try SitStayForever Organic Neem Oil Spray (contains neem oil, coconut oil, apple vinegar and essential oils). Neem Oil does NOT smell good, so be prepared for that. Of course, the fact that it doesn't have an attractive scent is probably part of the reason why fleas, ticks and other flying insects avoid it! Cedar is another natural flea and insect repellent. You can use Cedarwood essential oil (diluted of course), cedar chips in bedding, kennels and resting spots, and there are also a number of natural products whose active ingredient is cedar oil. Cedarcide Original is a natural spray (contains cedar oil and silica and has no artificial ingredients) which repels as well as kills fleas and ticks, and a number of other insects for good measure. You can use the spray on your pup's coat (avoid face/eyes/nose/ears of course) and also around the house and yard. Cedarcide Cedarsuds is a pet shampoo with the natural power of cedar oil and, unlike Neem Oil, it actually smells pretty good! To stop fleas from congregating in your yard try Cedarcide Petsafe Granules and BioLogic ScanMask Nematodes. I already touched on the subject of using essential oils for natural flea prevention in some of the paragraphs earlier on this page, but wanted to take a closer look at the subject here. Essential oils are an amazing natural option for treating a whole range of health issues in dogs, but you need to be careful when using them on puppies. Pick pure organic oils and always dilute them with a suitable carrier oil such as Almond oil, Jojoba oil, Coconut oil or Grapeseed oil for example. A basic recommendation for puppies might be .5% dilution (basically the amount of essential oil is 1/2% of the amount of carrier oil, a rough estimation would be 3 drops of oil per ounce of carrier oil). Always do a patch-test on little Rascal's skin before applying the oil to large areas, or to his coat. A patch test involves putting a few drops of the diluted oil onto a clearly visible area of skin and watching for any irritation or redness, or any other changes. Essential oils should not be ingested by your pup, so do NOT add them to his food or water and always discourage him from licking his fur/skin where the oils have been applied. There are many other natural options for preventing and repelling fleas which don't fit under any of the above categories. Only Natural Pet's Easy Defense Kits (there are four kits: Repel, Prevent, Protect & Ultimate). Each one contains a blend of natural ingredients. The 'Prevent' kit's ingredients include brewers yeast, essential oils, B vitamins, minerals and much more. Only Natural Pet's Flea & Tick Tag This one is a little science-y for me, but the tag uses your pup's natural energy field and pest-repelling frequencies to keep fleas and other insects at baby. Sounds a bit space-age but gets great reviews. Totally safe and natural. Baltic Amber Collar for Dogs This collar harnesses the natural power of raw baltic amber and offers you a very simple way to help little Rascal stay flea free. Amber is a natural tree resin which has electrostatic qualities and a definitive scent which is released as the amber is warmed by body heat (although it's not really noticeable to most humans). This method of repelling insects has been used for centuries. Make sure you buy a collar made with authentic Baltic amber as it's the only type which is truly effective. Fleas can mean Tapeworms too! 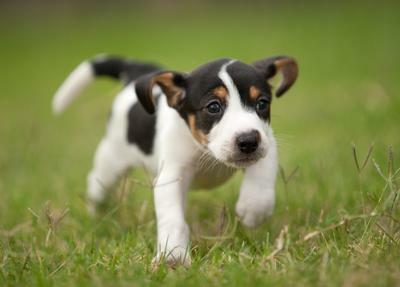 If your puppy has fleas, he may well have tapeworms too because these internal parasites are spread by infected fleas. To learn more about tapeworms, including symptoms and treatment options check out my Puppy Worms page.